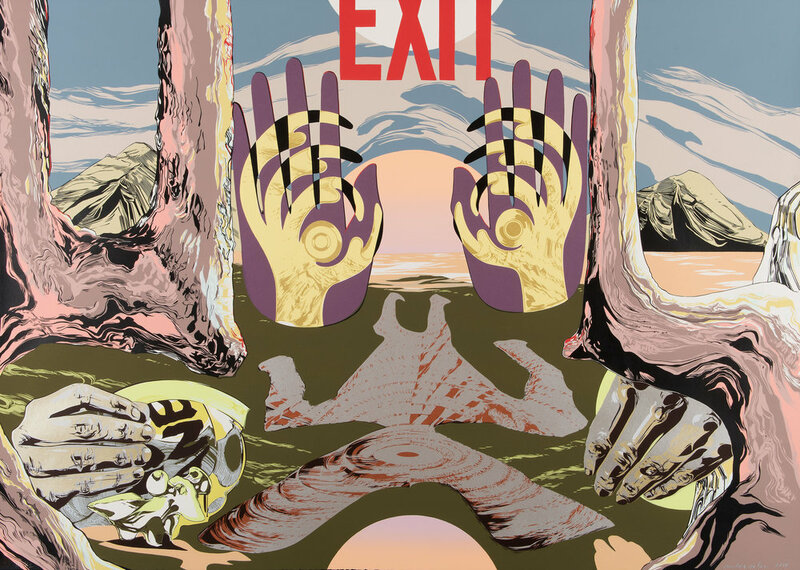 Highpoint Editions is pleased to announce one of our latest publications: Exit, an edition of 20 screenprints created in collaboration with artist Andrea Carlson. In Carlson’s second project with Highpoint Editions, Exit focuses on the idea of absence, propagating presence, and fear. Within indigenous communities exists a deep-seated fear of losing cultural practices, languages and artforms. Carlson references that fear with imagery depicting ancient indigenous mound creations - including the Man Mound of Baraboo WI, (central human-like figure) and the mica hand/talon of the Mississippian peoples. (overlapping purple and yellow) Found in the space between the Twin Cities and Chicago, (known by some as mound country,) these mounds live on lands of Anishinaabe tribes, Dakota and Ho-Chunk people, and have been cut into by the I-94 highway. Two disembodied hands, signing “exit” emerges from bent trees. On either side of the image are bent tree trail markers, created at mound sites by tethering saplings to the ground. These are used as directional markers, both in reality and in the print, used here to lead the viewer to the area in which the mounds float, guiding your eye up to the prominent red exit. Together the imagery showcases the effects of western culture post Columbus’s “discovery’ of America and the Western culture which followed. The artist created this print as a sigil for those who travel on I-94, and hopes seeing this print and knowing its references affect the minds of those who travel that path.